I am fairly certain that marshmallow is the greatest substance in the entire universe. Why marshmallow hasn’t been given a Nobel Awesome Prize is beyond me, but perhaps the best way to celebrate the greatness that is marshmallow is to revel in the explosion of marshmallow goodness that normally takes place around Easter time, when eggs, chicks, bunnies, and other delightfully adorable things all take marshmallow form to bring joy to millions. 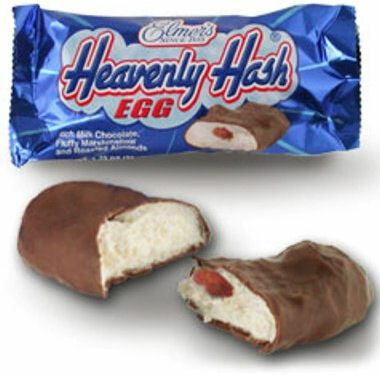 I am always on the lookout for random marshmallow candies (preferably chocolate-marshmallow candies, as they are the best) so I was intrigued when I came across an Elmer’s Heavenly Hash Egg, a delightfully old-school confection that I had somehow managed to miss over the past 28 years of my life. But after having one, I can tell you this: I shall never go without an Elmer’s Heavenly Hash Egg again. EVER. The greatness of the Heavenly Hash egg comes from it’s simplicity: smooth, creamy chocolate, a giant glob of marshmallow, and a crunchy, fresh almond stuck in the center of the candy, to give a bit of crunch to an otherwise gooey concoction. It’s a bit like eating a giant spoonful of super-marshmallowy rocky road ice cream; the flavors of the chocolate, marshmallow, and roasted almond come together to form a wonderful combination of crunchiness, creaminess, and stickiness. It is, perhaps, the perfect egg. Sadly, I have only seen the Elmer’s Heavenly Hash egg around my area over the past few weeks, leading me to believe that I should stock up on the seasonal treat while I still can. Sorry, New England! You’re going to have to beat me to them! lol I just came across this candy in our office kitchen when I walked in there initially to get me some ramen noodles, but instead grabbed this since I love sweets, I just couldnt pass by this giant ball or egg of sugar. I had the strawberry one and it was so darn good I actually googled this candy and was lead in to this blog. Now I want to try the regular blue one…ohh man…Idk who brought these but man I really need another one. off to it.